The language of ‘creativity’ is now well entrenched in urban and economic policy. The importance of the digital and creative industries to national governments cannot be under-estimated, and politicians, business developers and planning consultants all speak of cultural-led developments as boosting a city’s vibrancy and attractiveness to creative workers. However, the vacuity of this narrative has been severely critiqued and debunked as simply an excuse to continue developing real estate-led urban areas. Yet, despite the obvious problems associated with such developments, such as the displacement of those workers who cannot afford the new high rents, the often large scale demolition of low-income housing, the redirection of public funds from social services to business needs (and many others), these cultural-led developments continue apace; largely driven by private interests in the face of local governments who are desperate for investment. However, these development plans almost always fail to address key social and cultural issues around engagement, value, education and social services. Moreover, the local communities in which these cultural developments are embedded are rarely consulted to any great depth, and only lip-service is paid to their needs through bolt-on policies of education provision, local employment quotas or the most meretricious of phrases ‘social housing’. 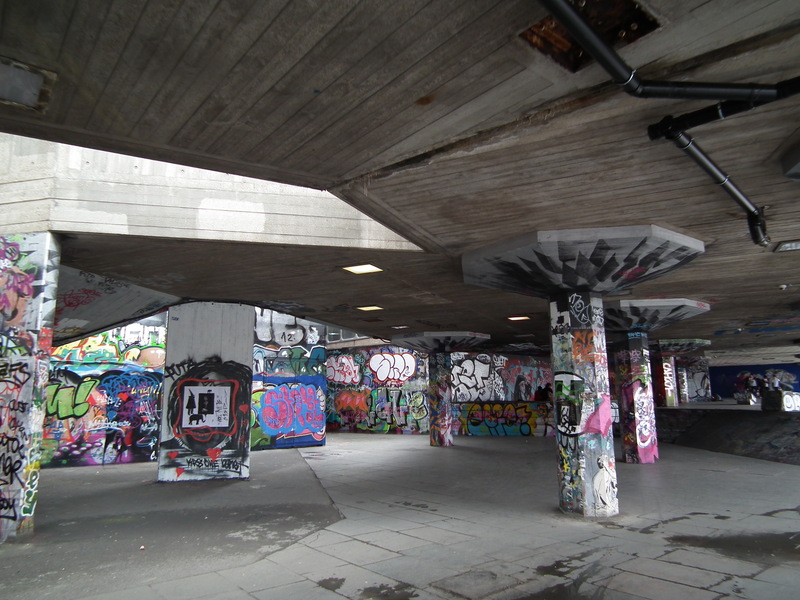 The popularity of the undercroft area of the South Bank is precisely because it was ‘naturally’ taken over by skateboarders from the 1980s onwards. Once a handful of skaters started to use it’s perfect curves and bowls, it’s grindable concrete irregular surfaces (and being safe from the elements), it gradually, over time, became a place in which skaters could congregate to practice their skills; and it spread through word of mouth. The fact that the South Bank initially tried to stop them is outweighed by their commendable decision to let them continue (when this happened though is unclear). One suspects though that once ‘they’ realised that spectators flocked to the area to see the skaters and BMX riders in action and then emptied their pockets in the surrounding bars and amenities, they were more than happy to let them continue. The area became iconic – it was represented in a Tony Hawks video game, tourists flocked to it, companies use it as a backdrop to advertise their products (see below), and Bradley Garrett and I used it as a location for a field trip locale during a session we organised at the the RGS-IBG 2010. From nothing, it became a skateboarders’ mecca. The processes involved in the creation of this place are complex and have an innate geography to them (if you’re interested, you can read about the theoretical argument in one of my recent papers). Suffice to say, by saying that ‘”You lot, go and play over there were we have fenced of a space for you”, is counter-intuitive, unproductive, patronising and completely against the grain on how urban subversions proliferate. The success of the undercroft area (and the subsequent tourist boost) is precisely because it started out as subversive and a reaction to ‘the city’ and all the economic and political powers it represents. In attempting to relocate the skaters, the designers of The Festival Wing have effectively killed off the subculture and created a commodified spectacle. The skaters will simply rediscover and reuse of different place of their own choosing, detracting from the cultural essence of the South Bank. In all the online and press literature I’ve seen, the skaters have been tackled head on by the developers. The argument goes that the Festical Wing will be ‘celebrating our skateboarding history‘, but for all the reasons outlined above, this is just political manoeuvring. Apparently, the undercroft site is a key entry point to the new development, however, one suspects that if they valued the skating heritage as much as they said they do, then they would find another entry point. I’m no planner, but it seems that there must be alternatives that could maintain the undercroft as it is, while maintaining entry? The language used in the Festival Wing development material that I have scoured online uses a empathetic tone, but in many ways, all this represents is the new vernacular of cultural planning. In ‘response’ to the harsh criticisms of recent creativity and cultural development policies (see first point), I have noticed that developments are now beginning to integrate community and subcultural language, yet with a similar superficial tone. Again, it is a political veneer that is designed to appease these criticism whilst maintaining the centralisation of the economic interests. You could argue I’m being cynical, but the fact that the undercroft area is to be lined with retail outlets I think says it all. Let’s not dress this up as a ‘celebration’ of skating heritage – it is clear marginalistion of subcultural activity that is seen as economically inconsequential, when the reality is, that it is part and parcel of the success of the South Bank. In sum, the undercroft area’s redevelopment will, I believe, be a mistake, and will be of direct detriment to the cultural vibrancy of the area. I can use a multitude of academic arguments about the need for a spread of cultural provision, the subcultural re-appropriation of the city and the vacuity of contemporary urban development, and all would be valid reasons to think twice. However, perhaps the simplest argument to be made is that by redeveloping the undercroft, the Festival Wing plans are being anti-South Bank, anti-London, and anti-social. They are basically saying that the South Bank (and by association of it being one of London’s key tourist sites) should be the sole playground of paying, high-end cultural consumers. There is no room for those people who make London a fabulous city to live, work and play. So, visit the campaigners website, sign the petition, join the campaign on Facebook, and visit the area on the weekend of the 4th – 6th May 2013. I cannot stress how dismayed I am at these plans, and how much they will damage the city I love. I’m currently doing a report, from a planning perspective, into the potential outcomes for the Undercroft; I’m indefinitely against the development and what it represents in the grander scheme of things. You mention a ‘multitude of academic arguments’ – I was wondering whether you can list a couple of the academic works and point me in the right direction as to why the Undercroft should remain. Planning student @ University of Sheffield. Well first I should point you toward my Antipode Intervention here: http://antipodefoundation.org/2014/02/03/intervention-the-southbank-and-the-skaters-the-cultural-politics-of-subversion/ and the film made by LLSB here: https://www.youtube.com/watch?v=iFaKN98Xg3E – both of which I guess you’ve already seen. If you need any more ideas, feel free to drop me an email!